Germany has announced plans to upgrade and expand its electricity grid over the next decade in order to help renewable energy sources fill the gap left by its phase-out of nuclear power. An investment of some €20 billion ($25 billion) will be needed. At the request of the German government, the country's four grid operators - 50Hertz, Amprion, TenneT and TransnetBW - have drawn up a joint network development plan which identifies the necessary grid expansions over the coming years. The plan - co-ordinated by the federal network agency (Bundesnetzagentur) - was presented today to Chancellor Angela Merkel, economics minister Philipp Rosler and federal environment minister Peter Altmaier. It will provide a basis for a federal plan designed to deliver the country's energy transition. According to the grid operators, "The nuclear phase-out and the increased supply of renewable energy are major challenges for the current infrastructure and require further development of the networks." Their plan identifies the potential grid investments that may be needed in the coming period on the basis of various scenarios. On-shore high-voltage grids in Germany will have to undergo considerable expansion in the next decade, the companies say. This expansion is necessary to facilitate German's energy transition and the development of the European electricity market. In addition to the upgrading of 4400 km of existing transmission lines, the grid operators anticipate that the construction of some 3800 km of new high-voltage lines will be needed over the next ten years. These network upgrades and additions would require investment of some €20 billion ($25 billion) by 2022. However, the grid operators note that these investments "account for only a fraction of the cost of the energy transition, but much success depends on their implementation." Failure to ensure a secure electricity transmission grid would cause higher costs elsewhere, they claim. For example, it could lead to regional shutdowns of renewable energy producers and power consumers, as well as costly interventions on the production side to reinforce the network. However, it notes that the actual implementation and timing of these investments depends to a large extent on the development of the demand for electricity transmission. The plan, the network companies say, is "the basis for sound planning of a transmission system on land that ensures stable network operation over the next decade, the integration of renewable energy and supports the development of a European electricity market." The network expansion "is a fundamental ingredient for the success of the energy transition," they claim. "For the successful implementation of this ambitious investment program, regulatory frameworks and a quick approval process will be as important as broad social and political support at all levels." 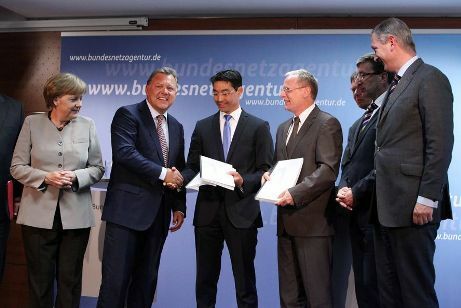 Bundesnetzagentur president Jochen Homann said, "The network development plan is a key step in the implementation of energy policy. Without reconstruction of power grids, the advances made in renewable energy will be futile." He added, "We want to accelerate the transition to renewable energy and, potentially, involve the whole of society in this process. Concerned authorities, organizations and citizens can participate in every step." Details of the draft plan will be available for public consultation until 10 July, the results of which will be included in a revised draft of the plan, to be submitted to Bundesnetzagentur in the second half of August. The government plans to pass the grid expansion law by the end of 2012. In the days after the Fukushima accident in Japan in March 2011, Germany announced a three-month moratorium on the operation of its nuclear power reactors that started up in 1980 or earlier. This was followed by a decision to permanently shut down those eight reactors. In addition, the country is to gradually shut down its other reactors, with the last one scheduled to close by 2022. Germany aims to double the output of renewables by 2020 to reach 35% of generation, while cutting its carbon dioxide emissions by 40% compared to 1990 levels. Even before the nuclear shutdown, the north-south Paffendorf transmission line experienced overloads of up to 125%, Bundesnetzagentur earlier noted. Should there be sudden failure of a power plant or grid node, "a line load in excess of 140% would occur which would be uncontrollable due to cascading automatic tripping of protective devices." These and other scenarios for instability "while extreme, are not so unlikely" the agency said.